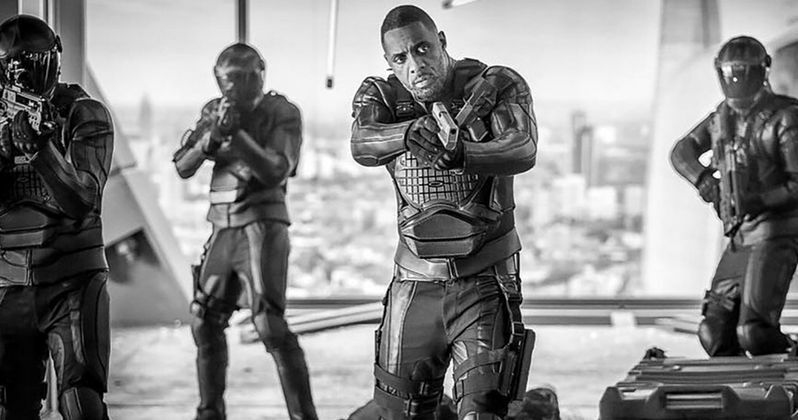 A new image from Hobbs & Shaw features the first look at Idris Elba's villain in the Fast and Furious spin-off. Dwayne Johnson is in full promotion mode for the spin-off, recently releasing the first image of him and Jason Statham together on the set, and now he is welcoming Elba to the party. Filming on the Fast and Furious spin-off has been underway since the middle of September, proving that Johnson is one of the hardest working men in show business after going straight from the set of Jungle Cruise to Hobbs & Shaw. Idris Elba was first announced as part of the cast back in July of this year. A casting call previously revealed that the character's name was Mr. Null, but it looks like that has changed to Brixton, according to Dwayne Johnson. Not only that, but Johnson reveals that he's quite the threat as well. He had this to say about Elba coming on board and his villainous accomplishments. "I learned a long time ago (when I was a very sinful eyebrow raising villainous man in the crazy world of pro wrestling;) that heroes are only as great as their greatest villains. A pleasure to introduce the man himself Idris Elba we brought in to our Fast and Furious franchise to wreak havoc, hell and mayhem on our heroes Hobbs & Shaw. The name: Brixton. The record: Undefeated. The promise: showdown of all showdowns. So cool having my brother Idris Elba come and play in our sandbox. This one's been years in the making!! As I always say, we either gonna get along or we gonna get it on... and f*ck getting along." Back when it was announced that Idris Elba had joined the cast of Hobbs & Shaw, the villain was described as a British "international terrorist who dresses in all black." The photo that Dwayne Johnson shared certainly seems to fit in with that description, with Idris Elba's Brixton taking aim with a pistol with some other unidentified masked men. They all seem to have the same armor on as well. Elba had this to say about joining the cast. "Excited to wreak havoc, hell and mayhem on The Rock and Jason Statham in Hobbs & Shaw as one of the most badass villains the Fast and Furious franchise has ever seen! Feels amazing to be working with The Rock and Jason Statham and to be joining the Fast and Furious family." The last set photo from Hobbs & Shaw that Dwayne Johnson shared was of himself and Jason Statham staring each other in the eye. While the characters are on the same team, they've clearly had their problems with each other, which will more than likely push the film along. The tension will likely bring some Fast and Furious humor along with it. However, it looks like Idris Elba's Brixton is going to be a force to be reckoned with. Hobbs & Shaw is all set to hit theaters on July 26th, 2019, which should give it plenty of time to tear down the box office. Spider-Man: Far From Home opens on the July 5th, so the Fast and Furious spin-off should have no problem taking the lead at the end of summer box office showdown, much like Jason Statham did with this year's The Meg. You can check out the first picture of Idris Elba from the set of Hobbs & Shaw below, thanks to Dwayne Johnson's Instagram account.